Prepare 4 long-stemmed goblets by rubbing the rims with a piece of lime section. 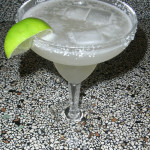 Dip the goblet rims in the margarita salt and then place the goblets in the freezer for at least 30 minutes. Juice the limes and then place the lime juice, tequila, and triple sec in a blender. Add the crushed ice until the blender is half-full and then process. Taste the result and adjust the flavors by adding more triple sec to make it sweeter, more lime juice to make it more tart, more tequila to increase the heat level, or more ice to decrease the heat level. Pour into the frosted goblets and garnish with a slice of lime.